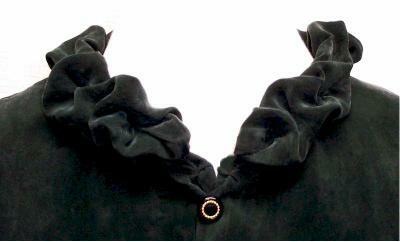 Recently I've been working on developing new blouse collar design variations. This "Crush Collar" is applied as a bias ruffle, then manipulated into folds that are tacked down randomly along the neck edge. 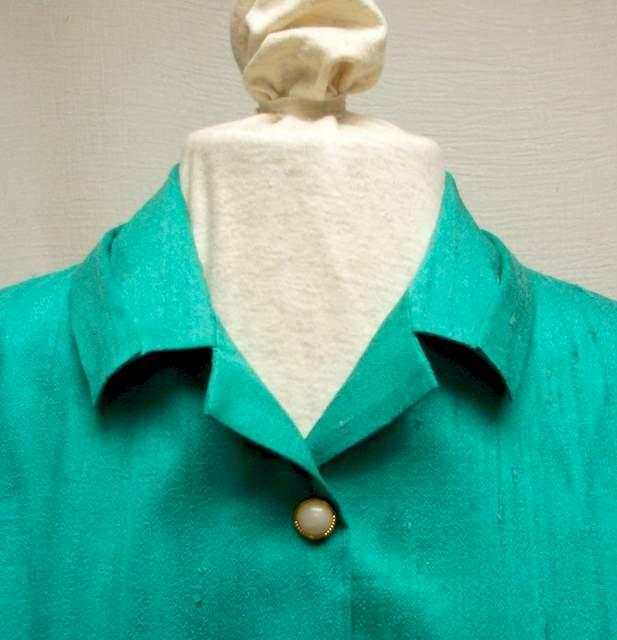 The center-front placket is tucked from the wrong side to soften the extension and complete the softly random look of the garment. Recently as I was stitching my...oh...10,000th flat collar, a wave of boredom hit me. So...I started to play! One of the ways I come up with new design elements is to tweak the traditional and see what happens. This pleated collar on a silk dupionni shirt/blouse is the result of my latest "play-time". All the pleat manipulation is done after the flat collar is applied to the shirt, the pleats fastened down by careful hand stitching on the collar's underside.